It’s not the most thrilling part of business, but the email disclaimer is a matter of lawful and safe operation for many organizations. Don’t worry if this all seems a little overwhelming. Read our top 10 email disclaimer DOs & DON'Ts and make sure that your organization is compliant with email law. 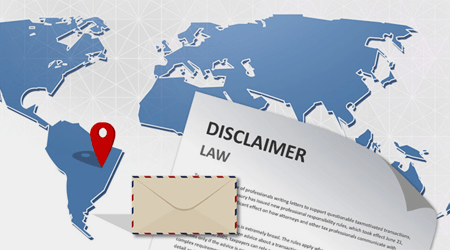 Whether you like it or not, having an email disclaimer is LAW in certain countries, particularly in North America and Europe. You don’t want to break the law, do you? Well if you don’t have an appropriate disclaimer, you very well could be. For example, if you are a registered limited company in the UK, the law dictates that you MUST include your company registration number, registered address and, if required, a VAT number in corporate emails. This is not negotiable and other countries within the EU and North America have similar laws. A disclaimer also adds another level of legal protection for elements like copyright or trademark notices to every email. They are designed as a way of protecting companies in an era of digital communication, so don’t think adding one is just a chore. The content in an email disclaimer will often include the company name, registered office address and company registration details which is a legal requirement for corporate email in many countries as mentioned above. 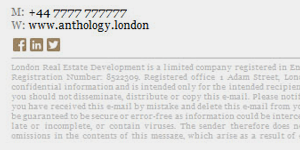 For sensitive emails, it is advisable to add a confidentiality header that states for whom the message is intended. The confidentiality notice should be included at the top of the email, since it will be the first thing a recipient will read. Putting the notice at the bottom of the email will mean that the person needs to read the email first, only after which they might be informed that they were not actually allowed to do so. 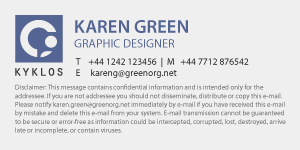 When people complain about email signatures, it’s usually with regards to lengthy disclaimers. There is actually no need to have an extensive disclaimer that is akin to War & Peace. You can use a few lines and include a link to a longer version online with more detailed information if required. The internal disclaimer text should be different from an external disclaimer. For instance, for internal mail, the virus and contact issues are not so relevant, but the confidentiality and employer’s liability aspects are all the more important to disclaim against. You can include a global internal disclaimer that gets added to every internal email or you can create user/departmental based internal disclaimers. There have been a number of lawsuits that have occurred due to internal circulation of offensive emails. Few businesses are thrilled about having to use disclaimers, but many have been hurt by ignoring them. You need to ensure you keep up-to-date with any law changes and update your email disclaimer accordingly. For example, you might start trading in a country that has new legal requirements or offer a product/service that falls within a particular law’s remit. It is important that you are always aware of regulations appropriate to your industry and geographic region. It is a good idea to include different disclaimers for each department since different issues can apply. For instance, the sales department might need to include a notice that all quotes are valid for 30 days and that the company’s terms and conditions apply to all orders. Financial departments, on the other hand, will send more sensitive messages and would require a disclaimer stressing the confidentiality aspect. 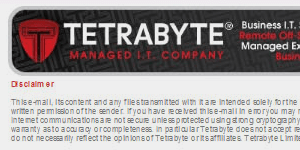 It’s very easy for disclaimers to flood an email chain with loads of text. It can even reach a point where you struggle to read the actual message content. When you’re the first sender in a conversation, place the disclaimer apart from the rest of the signature. That way, the recipient sees your logo and potential marketing banner before they notice the disclaimer. When you’re replying to a recipient, put your email signature below your own message but the disclaimer at the very bottom of the chain. That way, it’s still in the message, so you’re legally compliant, but it’s in a location where it doesn’t become annoying. With all the regulations out there, particularly the Canadian Anti-Spam Law, and the stiff penalties that can be applied to your organization, it is better to prepare for any eventualities than to do nothing. It is best practice to create an email disclaimer that is specific to your organization and the country you are based in, which is then strictly enforced as standard company policy. This means that you are less likely to run into any legal complications in the future. 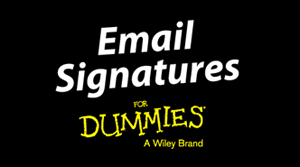 In order to enforce disclaimers across an entire company, dedicated email signature software and solutions can be used to implement disclaimer variations based on the situation of the email sender. Current email systems simply don’t provide the automation required to achieve full disclaimer compliance. With central management, you can ensure that all users’ corporate emails consistently have a professional email signature with the necessary compliant legal disclaimer.